View topic - Who developed arcade Zaxxon? - Forums - SMS Power! View topic - Who developed arcade Zaxxon? Hello! 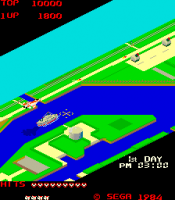 Is there any information about people who developed original arcade Zaxxon? In middle 1980's you could make guesses by looking at default hi-score tables, but in Zaxxon it comes clear. During that era, developers rarely got credits, especially not with real names. Are you looking for information above what's already on the internet? Wikipedia tells me it was developed by a subcontractor which makes it doubly unlikely that you'll find credits; you might find a few ASCII initials in the ROM if you're lucky. Thanx, I never noticed that line in the infobox at Wiki! Maybe I took it as granted that developer is Sega. However, it seems so 'serious' company that it could be done to maintain image. Or it is just really insignificant. Ofcourse contacts are made through inquiry form (I filled similar at Sega's site last week, haven't got anything so far, but sometimes such forms work and your question is headed to right people). I consider contacting Masumi Akagi himself. I think it could be very interesting and revealing talk - early arcade industry in Japan is still a mystery outside of that country. And then I've found this discussion which has excerpt of the book. Never heard of this company. It would make a great investigation for GDRI. Cool. Looks like this all wasn't really noticed until this summer. What program have you used to browse through tiles? It would be nice to have the whole list of games related to IT. And also how (what particular program is used) text is usually found in roms? I just played Future Spy (Sega's game - Zaxxon's hardware and engine, but gameplay is more like Scramble and Xevious, a lot of variety, though) and, adding groups of 3 letters, from Hi-Score table we read: Kajihara Katsuya Nagata Eiromrida. Maybe "r omr ida" is some means 'rom reader', Eiromrida sounds strange, Eiromida or Ei would be more normal, I think. Future Spy's graphics style seems to be more like that found in Sega's earlier Buck Rogers and Subroc-3D, than in original Zaxxon games - Future Spy looks almost like cute'm up. Notice dithering (checkmate shading) on fuel cans, BTW! Hi-Score table we read: Kajihara Katsuya Nagata Eiromrida. Maybe "r omr ida" is some means 'rom reader', Eiromrida sounds strange, Eiromida or Ei would be more normal, I think. It could also be interpreted as "muri da", which means "impossible". Isn't it typical that it's Hally that brings this up? What program have you used to browse through tiles? I usually just open them up in Notepad. ROMSearcher does "relative searching" which helps a lot when the text is not stored as ASCII. I'd say the majority of text is like that in SMS roms at least. Time to read help file for me, I guess. Checked. It worth. Wish more translations like that were available - everyday so many people translate anime for free, they could use their forces for something like that. I've got to test it soon! Now I have on hands Japanese book about videogames released circa 1987, maybe there's some clues? I attached scan. No, no mention of anyone but Sega there. I'm pretty shure that graphics of Congo Bongo was drawn by the same artist as those in Super Zaxxon, at least one of them. Reason - Dragon in SZ drawn in the same style as Congo in CB. Been artist a Sega's own artist or IT's - it's unknown, however. BTW, is Future Spy IT game or not? And what button combination brings up tile viewer in MAME? I didn't see the ITC logo in Future Spy. As Heliophobe said, press F4, then press enter. 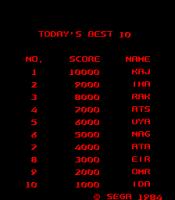 Those high score initials spell out names, all of which show up on Star Jacker (AC).